I noticed that Jim Spaulding was sporting a new hat last week. As co-owner, he’s created a division of the HideAway Coffeehouse & Winebar called Spaulding Sealcoating that also includes, according to the wording on the side of the van, crack repair, pot hole repair, and striping. I’m not sure of the connection between coffee, wine, and sealcoating but I’m sure Jim can tell you. Sidewalk dining in Northfield: Why is The HideAway still the only one? 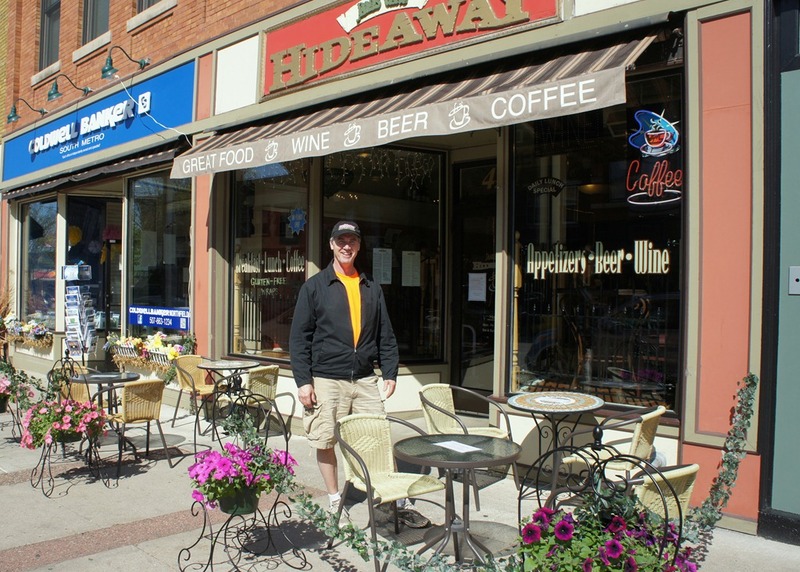 As far as I know, the HideAway Coffeehouse and Wine Bar is still the only eating and drinking establishment in downtown Northfield to offer sidewalk dining, including serving wine and beer. I stopped by to chat with co-owner Jim Spaulding earlier today and I asked him why others had not tried it. The ordinance has been on the books since 2008. He didn’t know and neither do I. See all the sidewalk dining-related blog posts going back to 2006. 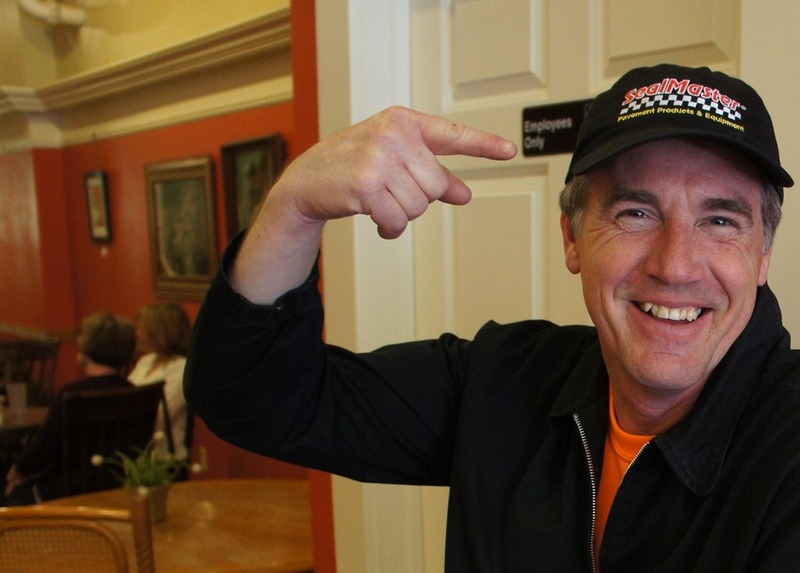 It’s not often I get treated to a meal with my LoGro hat on, but it happened yesterday. My beneficiaries: regular commenter and resident punster John George; and Nancy Amerman, an occasional object of my blog spoofs. 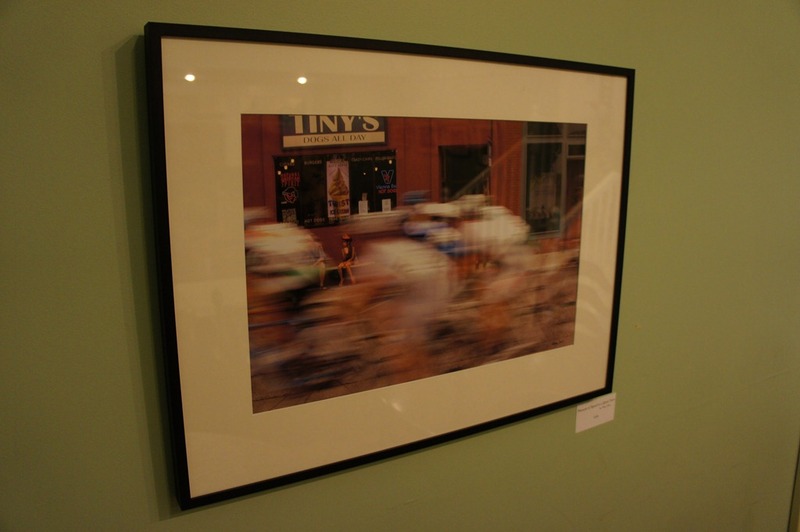 We ate at the HideAway Coffeehouse & Winebar. John and Nancy are members of Transformation Northfield and Nancy is a member of Rejoice! Church. Both organizations have been the subject of, um, my critical attention here on LoGro (TN tags here, Rejoice! tags here). 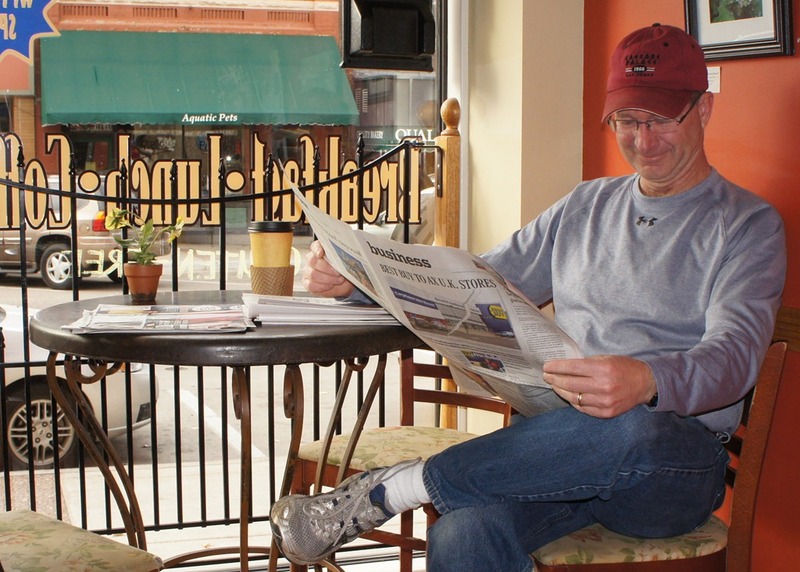 Initially, no, but when I noticed a plainclothes Northfield police officer (once again in really plain clothes) pretending to be reading a newspaper at an adjacent table, it gave me pause. Was he expecting things to get out of hand? And how did he know we’d be there? Was he following me on Foursquare? Tracking my tweets? Does he know where I live? As it turned out, we didn’t even talk religion so violence wasn’t an issue. We kept to non-controversial topics, like politics. We had fun, as you can see. So no worries. Move along now. Nothing to see here. 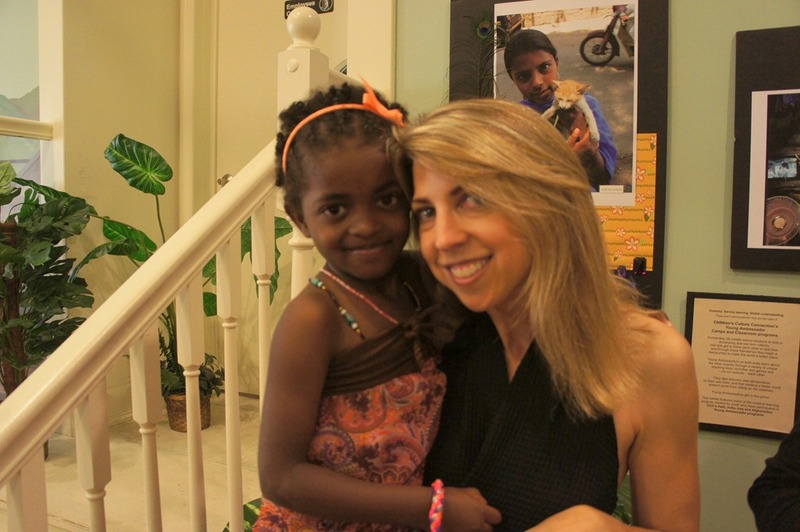 The artwork of children who have participated in several of CCC’s programs (in India, Haiti, Iraq and the U.S.) will be on display… I will be presenting on our latest programs for Northfield youth, along with middle-school-age youth who have participated in our programs. 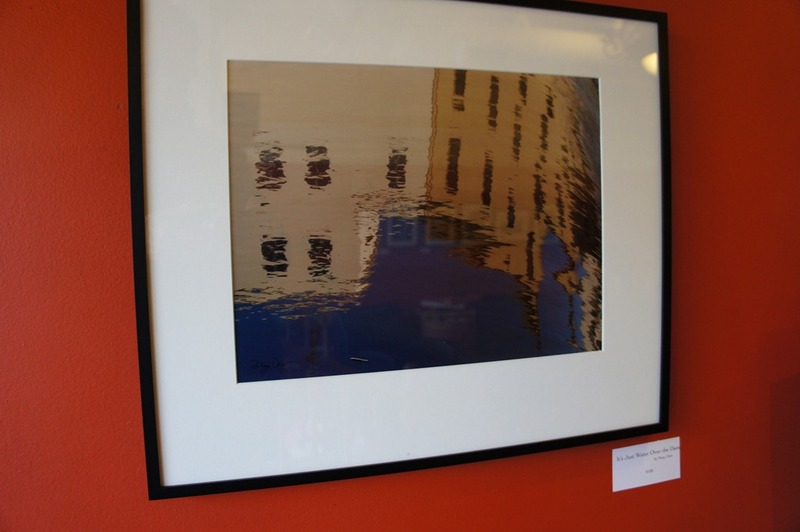 We will also be holding a raffle for a three-hour limo ride and a David Allen print. 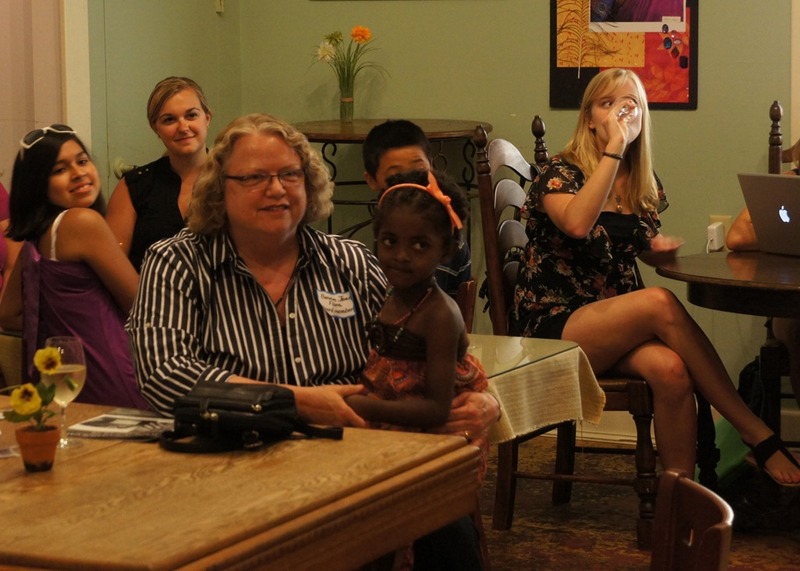 Dina also presented info about their Summer Fundraising Event coming up next Saturday, July 23 from 2-5pm. See this PDF flyer and the CCC website for more info. 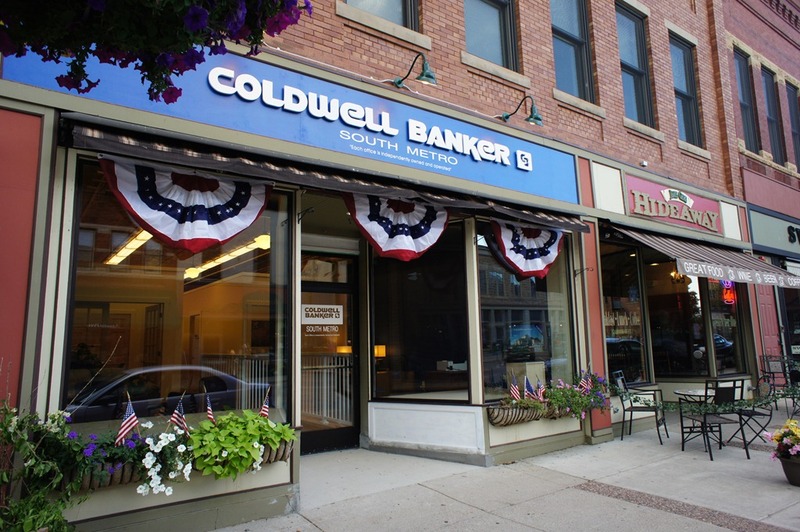 Coldwell Banker South Metro has completed its move from S. Hwy 3 to downtown Northfield in the old Present Perfect space. They’re now right between the HideAway Coffeehouse & Winebar and the Hogan Brothers Acoustic Café. 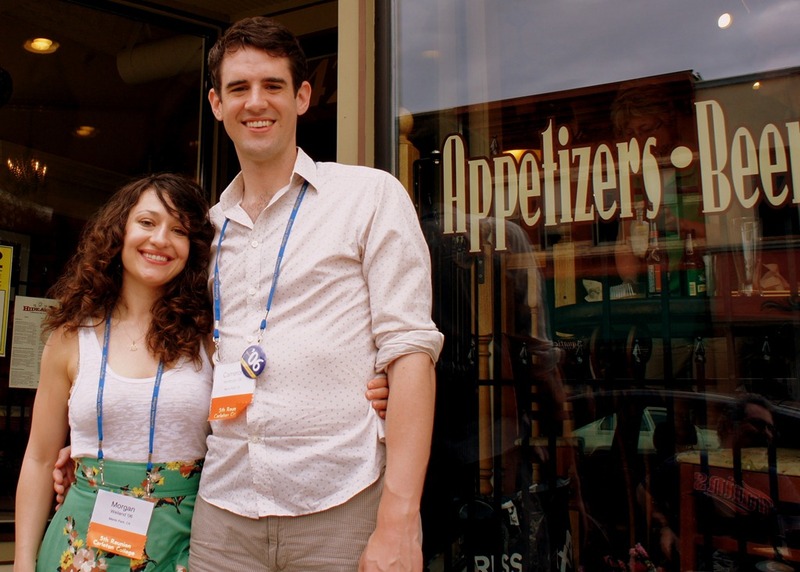 Cameron Nordholm and Morgan Weiland were in Northfield this week for Carleton College’s Reunion week. They graduated in 2006, got married last summer, and are now living in Silicon Valley. 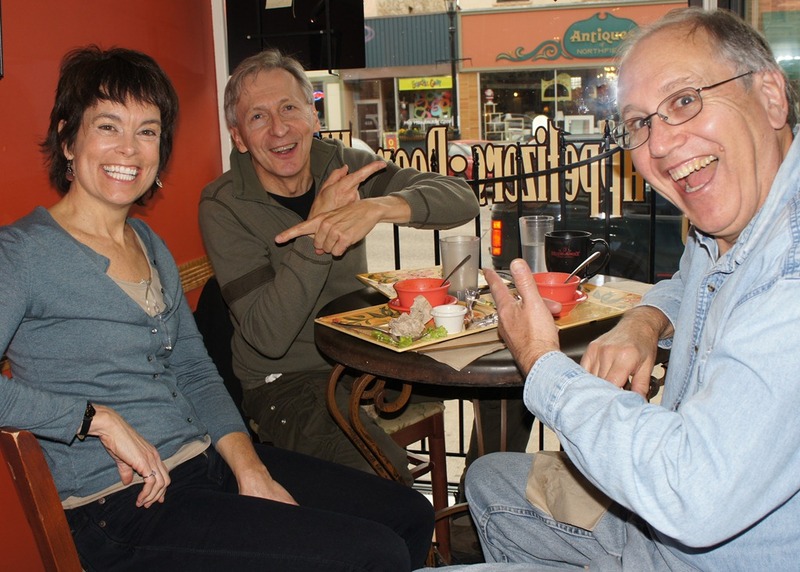 We had lunch with them at the HideAway Coffeehouse & Winebar on Friday. So who cares? Well, we do, since they’re the parents of Locally Grown, and like all good parents, they keep track of us and regularly visit. See all our LoGro blog posts tagged with Cameron Nordholm or tagged with Morgan Weiland. And you can keep track of them via their blogs, here and here. 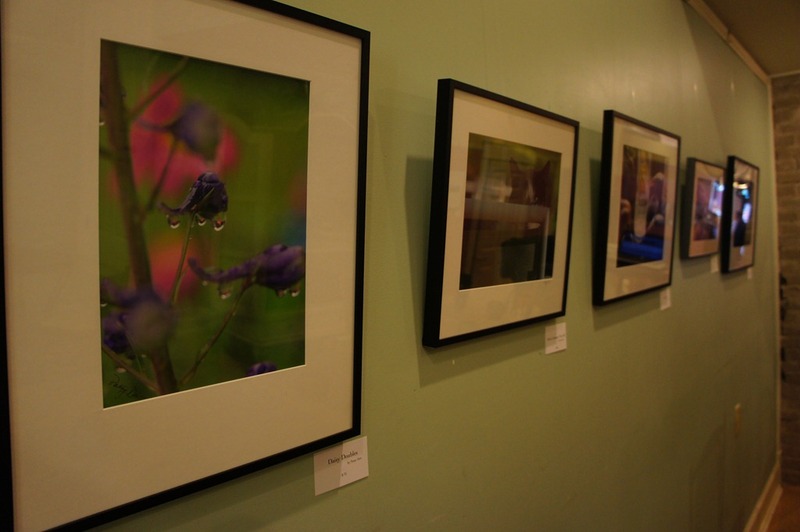 Northfield photographer Patsy Dew is exhibiting some of her photos at the HideAway Coffeehouse and Winebar. 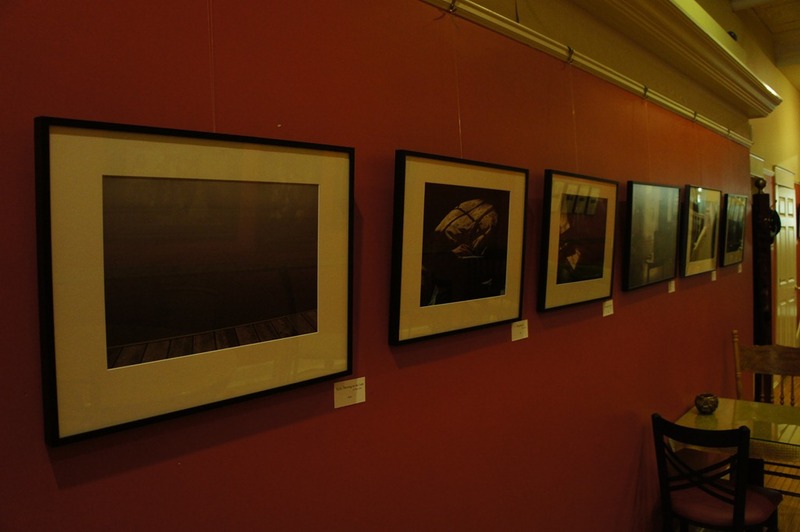 The Fond Farewell Party for Patsy Dew at the Arts Guild this past Friday night (9-22) was great fun. 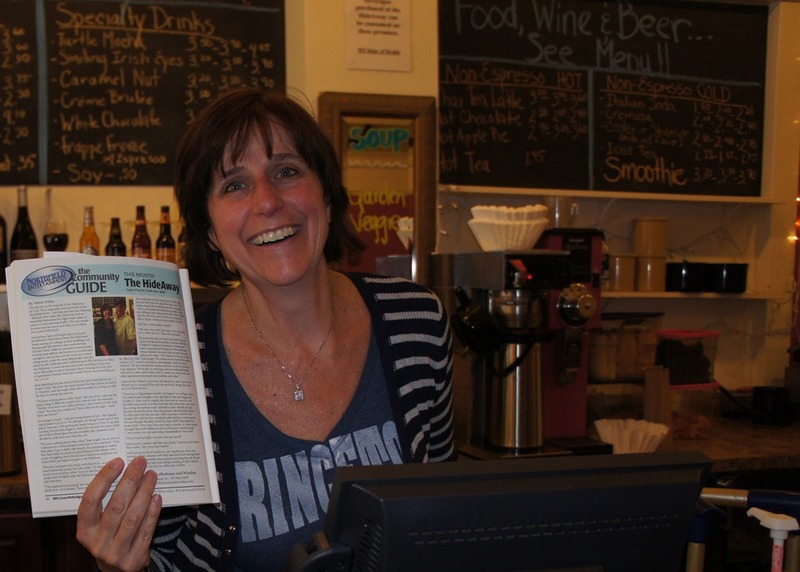 Patsy has left her position of Program Director at the Guild, and after 15 years of her work you can bet there were lots of people with stories to share and tributes to make. Some theater folks did a surprise reprise of one of Patsy’s theater roles, and another group put together a slide show of some of her moments on stage as actor or director. There were dance performances, limericks and poetry, lots of good food and fun. Here are some pics! I’ve been experimenting with Foursquare for the past couple of months. The app on my Android phone (also available on the iPhone, Blackberry, and Palm) uses GPS to show a list of nearby places. I can then check in to see if the business is offering a foursquare special, alert selected friends (txt msg, Twitter, etc) to my location, earn points, and acquire ‘badges’ for repeat check-ins. The person who has checked in the most at a given location becomes the ‘Mayor’ of that location. I’m currently the Mayor of the Goodbye Blue Monday but just lost my mayorship to someone named ‘Dan’ at the HideAway. Nationwide, retailers are starting to offer Mayor Specials. Starbucks launched a nationwide Mayors Special last week. 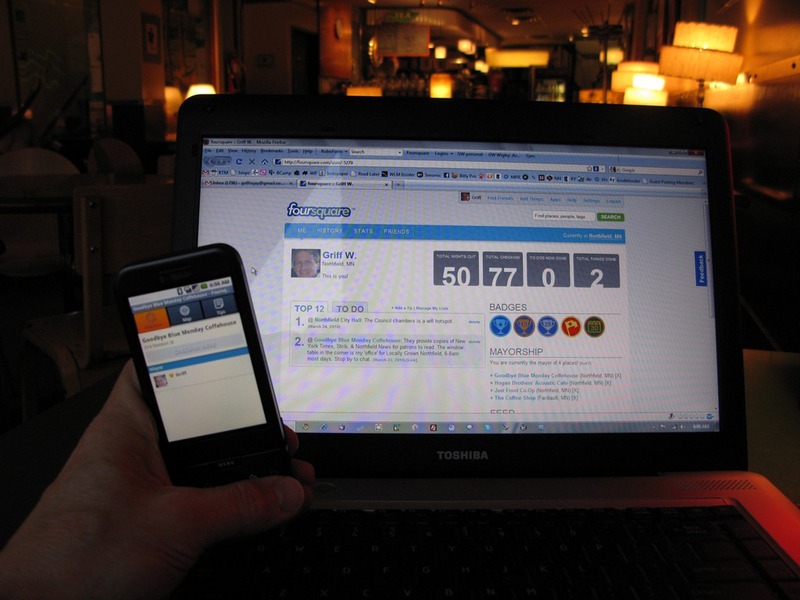 What other retailers are using Foursquare in the Northfield area?